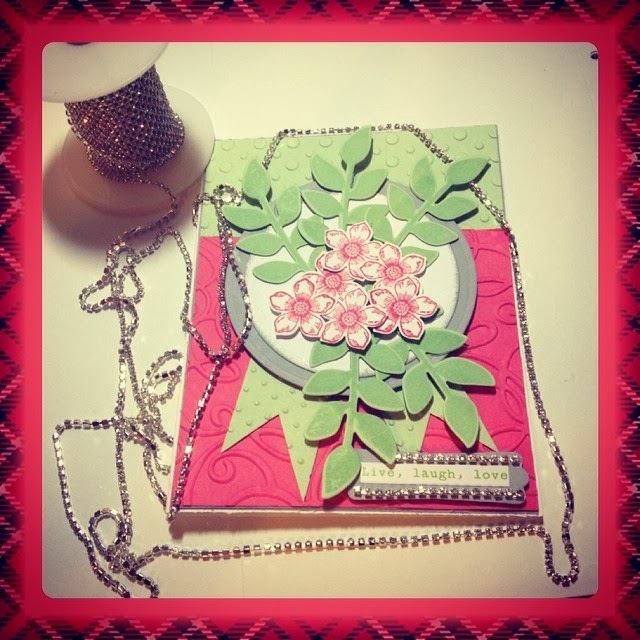 Here is an easy card that I created for the challenge at Less is more The challenge was to be 1 layer and 2 of something. These little guys are so cute with their googley eyes and bling red buttons. I also heat embossed them with "primary bark" WOW embossing powder. I sporadically added the red and green sequins. The stamp set I used is scentsational seasons by Stampin Up! I hope you enjoy what I have created, Don't forget to let me know that you were here!! Have a great Monday everyone!! Repost, Here is one that I completed that is only 1 layer. Although I did heat emboss the gingerbread men. Happy weekend everyone, I hope you all have had a good one so far. I am going to make this a quick post as I want to get going onto another sketch challenge. This sketch is from Mojo Monday! All the details are below. I hope you enjoy my creation! Whisper white,gumball green,midnight muse and strawberry slush card stock from Stampin up! DP is a 6X6 stack from Echo Park(beautiful life). for a little shiny I added some sequins. Hello everyone and Happy Friday to you all. I completed this challenge card from Mojo Monday on Tuesday but this is the first chance I have had to load it up and share it with you all. I love the colors on the card. I used a paper pad from Simple Stories, "Vintage Bliss" The colors are really summery(even though we are at the end of summer) I wanted to get one last summer card in! 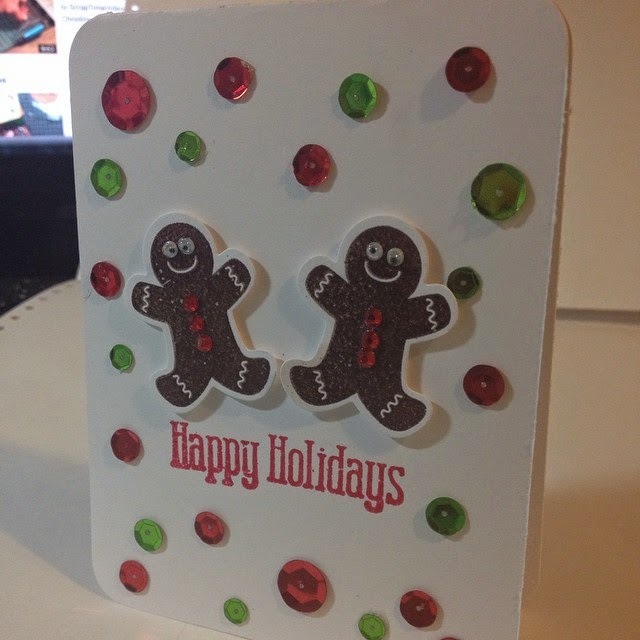 The "hi" is a wood embellishment that I colored using magicals from Lindy's stamp gang. Let me tell you, they are so sparkly and pigmented. I took a little scoop out of the little pot and added a drop or 2 of water and wow, So pretty! I then went over the piece with paper glaze. I added a little silver butterfly charm over to the right and attached it with the pink twine. I hope you enjoy my creation and hopefully, I will be back soon!! Hello there everyone! Well, here it is, almost August. Please let time slow down just a bit. We have had the most mild summer here in Nor Cal. I mean, the next few days we are supposed to get 100° days but we really haven't had too many of those this summer and I am OK with that. So, onto my challenge card. I played along with the sketch over atMojo Monday and it was supposed to be tall and skinny so this is my tall and skinny 3 1/2 X 9 1/4 creation. The paper I used is from Prima's Princess Collection. The sentiment of from A Stampin Up! stamp set called Whimsical words. The flowers I punched out with one of my flower punches and I added some stickles around both of the flowers. I put this one together rather quickly and I am really happy with how it turned out. Go on over toMojo Monday and check out all the other great creations that some really talented ladies came up with. Thanks for looking and don't forget to let me know that you were here. Have a wonderful week!! 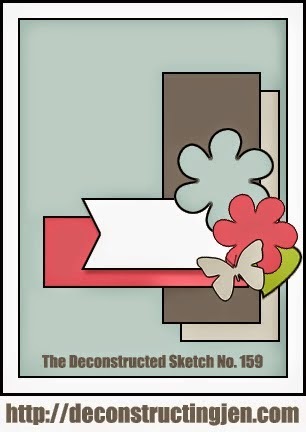 Hello Friends, Today I have a challenge card for you that I created for"Mojo Monday"
I haven't played along in any sketches lately so it's time for me to pick up where I left off. Mojo Monday is one of my fave sketch challenge sites. So, for the details, I used an ivory for my base and also used Garden Green and pretty in pink card stocks from Stampin Up! The DP I used is from a 6X6 stack called "Anthologie" by We R Memory keepers. I added an antique brad and some twill trim and at the bottom is some green ball trim from my stash. 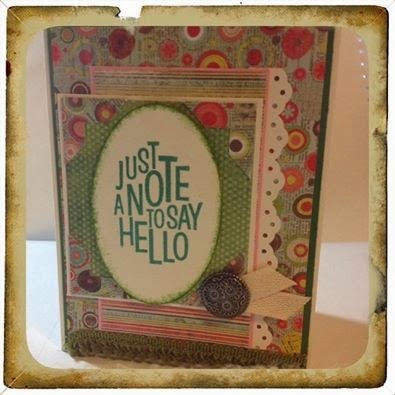 I used my oval nesties and stamped "Just a note to say Hello and i heat embossed that in green. I then inked the edge of that oval piece. Well, That's all for me now. 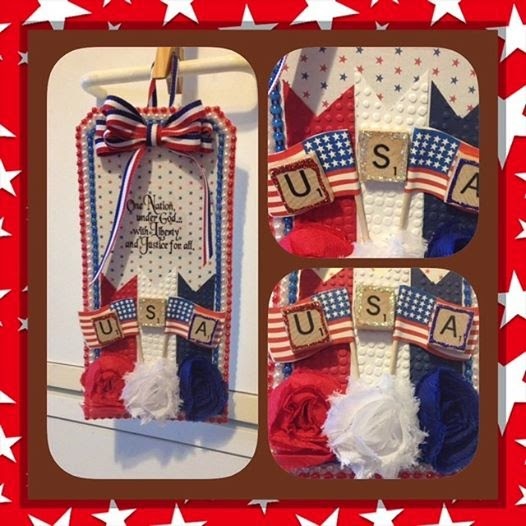 I will be back real soon to share some more of my creations! Hello Friends, I have been gone for a long time now and I think it's time for me to get it in gear and share what I have been up to the last couple of months. Well, first things first, I am on summer break right now, Woo Hoo!!!!! Oh, did I think that out loud? LOL! Well, I was very ready for summer break. So, on top of being on summer break, I did get a part time summer job, I am a cashier at (drum roll please.....) Hobby Lobby. Concord, Calif. finally got a Hobby Lobby. It's a fun place to work and we are closed on Sundays so I wont miss the swap meet that my husband and I go to every week, yayyyyyy! It is so much fun to see the new paper crafting goodies that come in and even better is getting my crafty,inky little chubby fingers on all of the Clearance goodness! Even though we are a newly opened store, We have the most beautiful clearance wall. I try to refrain but c'mon, it would be so wrong for me to pass up a Tim Holtz banner die for $2.00, Now wouldn't it? Hello Friends, Just wanted to drop a quick line to let you all know that I am still around. I have been super busy and just couldnt find the time to get a post out to you guys. So, I have finished a few projects lately, Just doing some playing around. So, this first card is one that I created and really, just playing around. I had purchased a roll of 10 yards of 2mm. bling, Oh how I love Bling. I just wanted to use it on something so on the sentiment is where I chose to place it. It just adds a little bit of something to an otherwise flat card. For this next photo, I have been really having some fun creating chunky charms. This is one of my first charms and I really had fun creating it.